Very rare combination of both Andrew Carnegie and John Pierpont Morgan on the same album page. 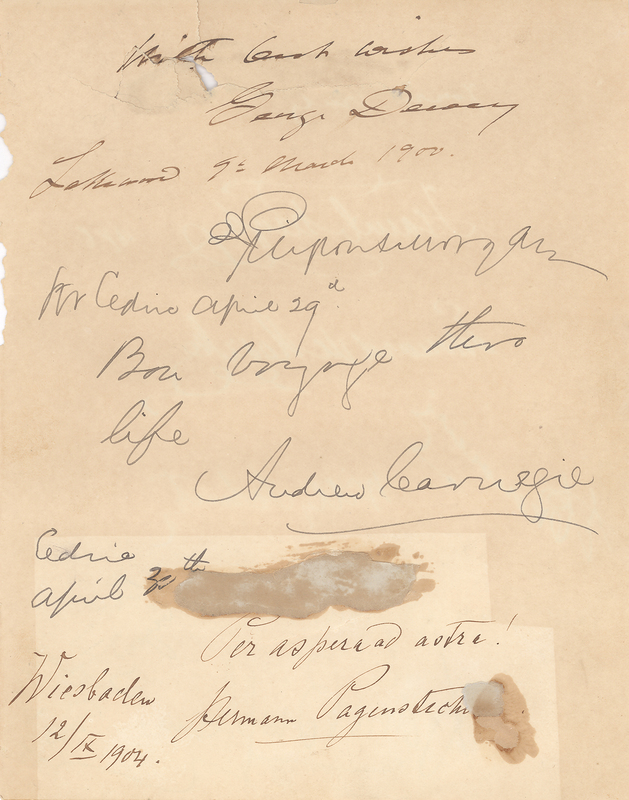 8 1/4 x 6 1/2" album page with signatures of J.P. Morgan and Andrew Carnegie (who added "Bon voyage thru life"), as well as George Dewey and others, collected by a Mr. Cedric between 1896 and 1904 The two stuck which has been called the deal of the century when J. P. Morgan formed U.S. Steel, the first billion-dollar corporation, in 1901, it marked not only his signature deal but the apogee of banker power in America. The negotiations would feature Morgan in his most famously histrionic mode: knocking heads together, barking out prices for properties, and forcing titans to truckle to his will. In the end he fused together a trust that controlled 60 percent of the steel industry and employed 168,000 workers. This colossus encompassed everything from Andrew Carnegie’s massive steelworks to John D. Rockefeller’s iron ore and shipping interests in Minnesota. As the deal’s impresario, Morgan forever altered the balance of power between American industrialists and New York’s financiers. 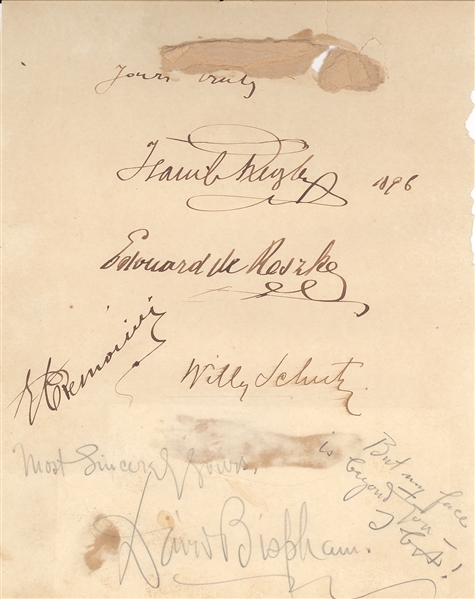 Please note the back side of album page does have signatures of music realted performers, including Édouard de Reszke, and David Bispham, both where illustrious opera singers active in Europe and America during the late-Victorian Era. The Dewey signature does have a tear going through part of his saluation and signature due to the original mounting on reverse, which still has remnants.